Greetings my fellow renovators and particular handy people. Well, another month has past and it’s time for an update. The posts will come more frequently and not as long after this one because fancy stuff will start to happen. Or I hope so. We’ll start in the small 2nd floor master bedroom. It’s not a huge room, and that’s fine by me. I wanted a smaller cozier place to lay my weary head. But no time for rest now, we’ve got to get busy. The textured ceiling is finally removed. This was a messy, no fun procedure. I’ve added a wood banding at the ceiling wall junction and painted the walls BM Sterling gray. The ceiling was difficult because most of the intersecting joints were cracked. I removed the paper tape in all of the corners and added a composite flexible corner tape called StraitFlex I added another wood banding to create a beam appearance. I also added some upright pieces to add a little detail. The wood beam on the back wall is a support beam for the steel I beam that is hiding behind my new wood banding. We’ll make pilaster covers for those. After a lot of fiddling and drywall mud, I finally have the ceiling and corners where I want them. 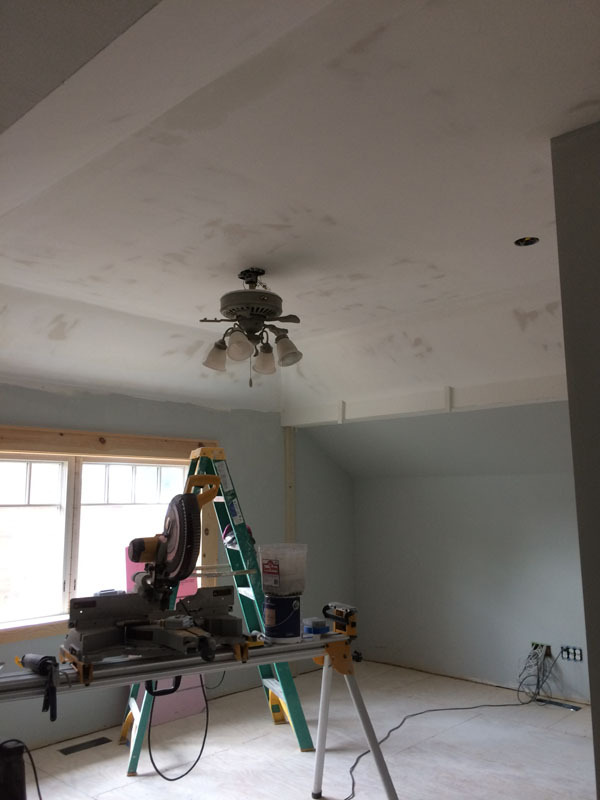 So on goes a couple coats of ceiling white. At this point I wasn’t feeling the gray wall intersection with the angled ceiling. Something about it said “not finished’. Adding trim would be a nightmare with all of the angles and layout of the room. So while we ponder that great question, we might as well put some finish on the wood window casing. Most of the other window trim in the house is made with poplar for solid paint. This room will have a little more rustic feel, so knotty pine was used. Here I’m adding a wash coat. Once I put on the paint, I give it a light sand and then a couple coats of Varathane water based clear coating. The waterbase coating won’t yellow over time like polyurethanes will. And when I finished that I decided to paint the walls the same color as the ceiling. So that solved the weird angle paint dilemma. This is an all white room, with a white floor as well. We used white so much because I have a lot of art and that will add some color to our spaces. 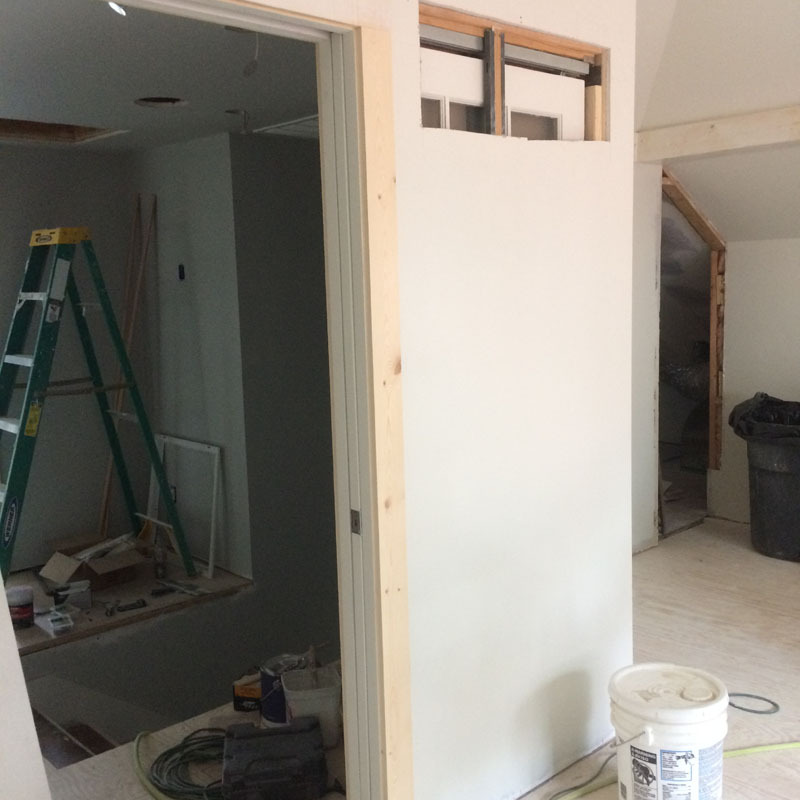 The pocket doors are ready to be painted and installed. 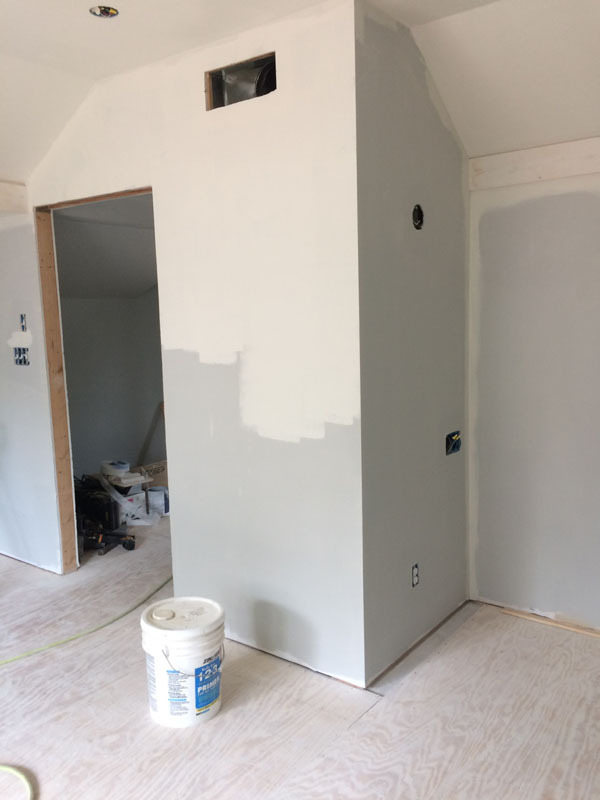 I skip over much of this door painting exercise, but it took a very long time to paint and finish the two pocket doors for the bathroom and bedroom, and I still have another one to paint for the closet. The doors have textured glass for privacy, yet it allows light through to brighten the space. All of the glass doors are like this. Now we hop down to the 1st floor and get everything out for the new oak floors. It’s not been this clean since 2009. I’m still working on the direct vent fireplace, we’ll get that sorted out before winter. It’s kinda nice to be able to walk in through the house without tripping over something. Here’s one pile of white oak for the 1st floor. And here’s the other pile that’s needed to finish the 1st floor. This is 2 1/4″ 3/4″ white oak. As much as I would have liked to lay these floors, I contracted it out to a very skilled installer. Here is the start looking from the living room into the kitchen area. He’ll be here a couple of weeks on the first floor, and again for the second floor. It would take me months to do this. Back upstairs we find a problem. The pocket door was nice and flush to the door casing when closed, but when pushed back into the pocket, the bottom was back about 1″. Bad news. That meant the track inside the pocket was not level. The front was, but not the back. So we cut some holes in our new drywall and make some adjustments. The hole allowed me to lower the back of the track to make everything level. So I’ve paid for my mistake. So we make a new drywall patch and screw it in place. We tape and mud and feather it out. Move along, nothing to see here. And the door is flush to the casings when open and closed. Meanwhile, while my door drama is unfolding on the second floor, the hard wood guys are busy at work laying the floors in the sunroom. 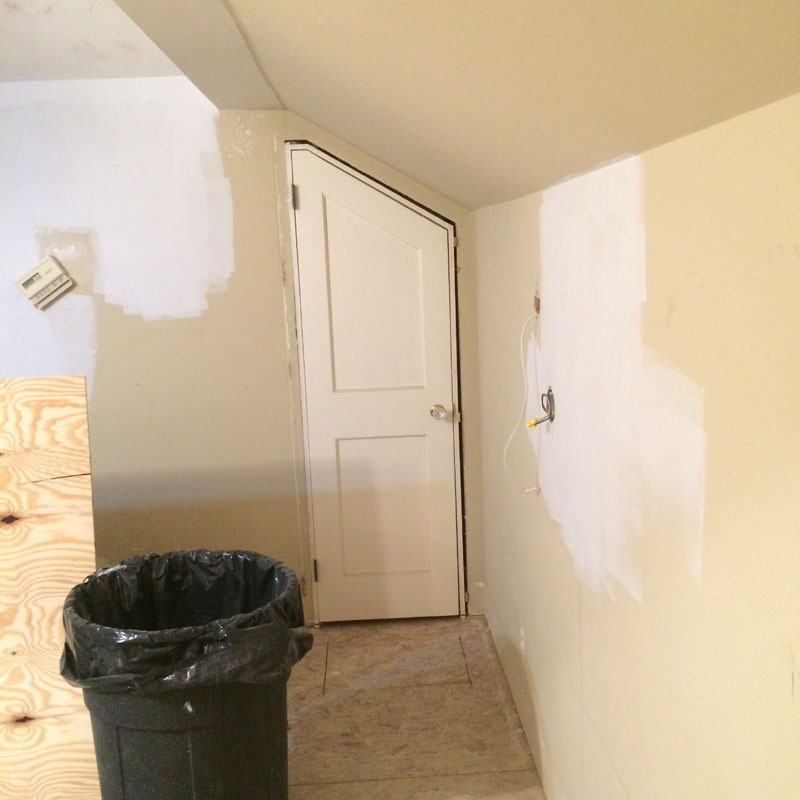 You might recall in my last post this photo of the access door that is in the master bedroom. The 2nd floor HVAC unit is behind this area. I wasn’t feeling this ill fitting door, so I had some time to think of a solution. So the solution was to make a panel on the opposite wall to mirror the new door I’ll make for the opening. Here I’ve applied the wood directly to the drywall. The panel was meant to fit next to the post cover I made to hide the support beam. On the door side, I made a new door and a pilaster cover to match the other side. There is no support beam here, so it’s just for show to match. I used euro hinges that are removable, so if major service is needed the door can be removed all together in seconds. I painted the door the same paint color as the wall. I didn’t add any door hardware, as It’s easy to open. The gap at the bottom will disappear when the new floor goes in. And the dummy door is painted as well so everything matches. So after 8 years this month, things are finally going back together. I’ve got to get the appliances ordered so I can make a final design of the kitchen. But let’s not get ahead of ourselves. Hang in there – something’s bound to happen. 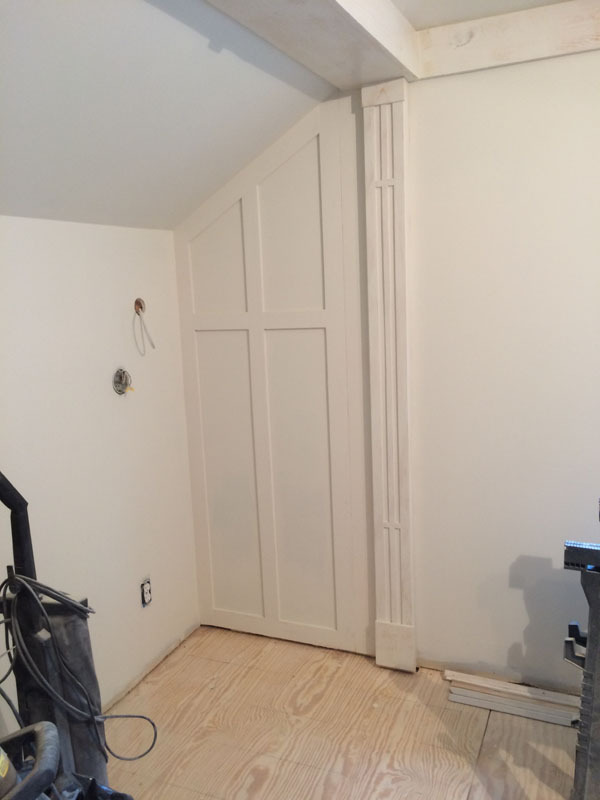 This entry was posted in Floors, Master Bedroom and tagged 1930's bungalow, DIY Home, Fixer, Fixerupper, Home Renovation, Master Bedroom, Oak Flooring, Old Home Renovation, Remodeling by curt. Bookmark the permalink. Wow. Great solution on that HVAC access door! Thanks Mary – is a slow slog, but we’re making progress. Thanks for stopping by. Everything looks so beautiful! I can’t believe it’s been eight years but it certainly has been worth it. I love following your meticulous and aesthetically perfect work. Can’t wait to see those floors! Time flies Ms. D! I appreciate the kind words. I’ll try not to screw this up. 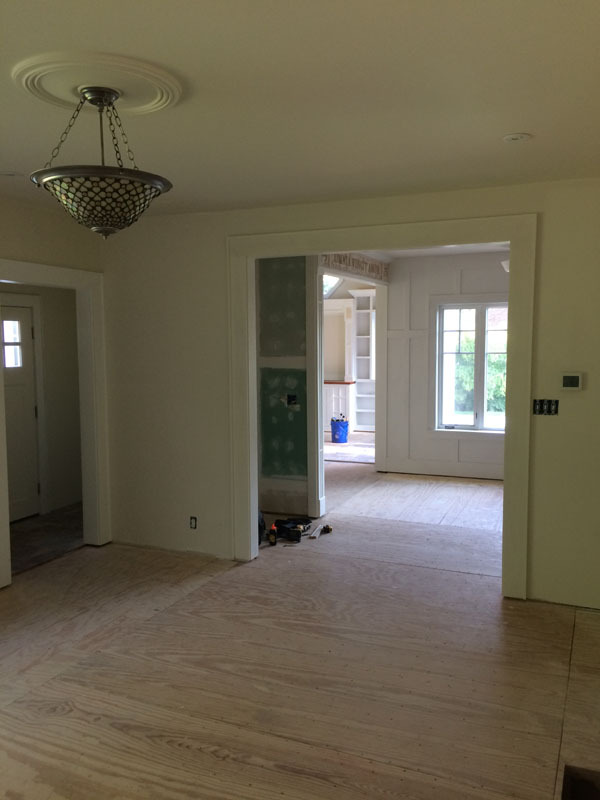 You must feel so good when you see that beautiful oak flooring going in! The faux door solution is perfect. Bravo! Thanks D’Arcy. It does feel good having a floor I’m not constantly dodging and falling over stuff. Thanks for your kind words. Thanks Dan, I appreciate the comments from a fellow renovator. Thanks Denise! We’ll see if I get this place done this decade. Everything looks awesome! Nicely done. I have a quick question about your pocket doors with the textured glass. Are you able to see shapes and outlines through it? Or does it really only let light through? We have been toying with the idea of putting a textured glass door on one of the bathrooms to let light through, but I am super paranoid that you will be able to see through it. The samples that I’ve seen don’t really give me a good feel for what I could expect. Good luck with the rest of the house! Hi Andi – thanks so much! I used a pinhead texture for the glass. As to the glass, if your a foot away it’s just a blur and farther way it’s difficult to make out shapes. It was the most diffused of the glass options we could find. I have 7 doors with this glass and really like the way the light goes through. It isn’t opaque though. If you want something super private, you could go with a white stained glass like I used in the living room. The windows look directly into the neighbor’s brick wall, so I wanted something more opaque. Looking great! As always, I enjoy seeing your progress. Thanks so much Rebecca! I enjoy getting things done – it may take awhile, but it will get there…I hope.